Suddenly it’s six and the kids are asking what’s for dinner and I am too frazzled to even come up with an answer. Please tell me I am not the only one!? 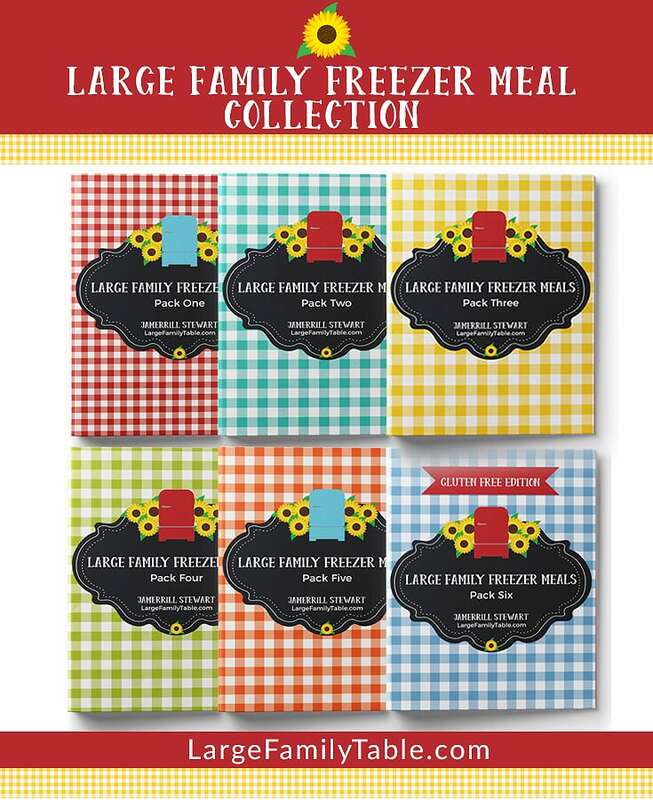 As a large family mom, I know that despite all of my best efforts there are going to be nights when the awesome meal plan, freezer meals, and/or the pressure cooker is simply not going to be enough to “save the day”. Even though I have a very simple meal plan that I rotate through each week, there are days when the mornings are too crazy, the homeschool lessons take longer than expected, and I forget to take meat/dinner out of the freezer to thaw. That’s when I turn to my stocked pantry and whip together a wholesome meal in around 15-minutes, about the amount of time it takes for my husband to clean up & be ready to eat after he gets home from work (ask me how I know … ahem). These foods are a lifesaver when my day is not going as planned. 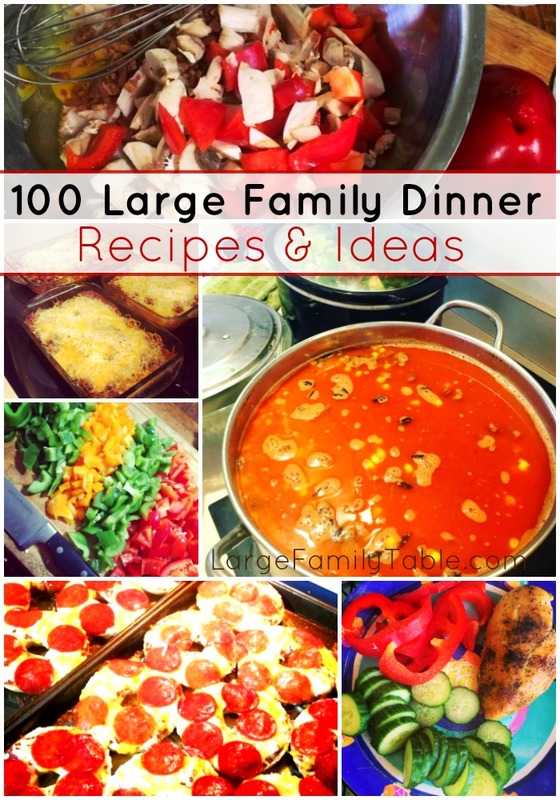 These are quick & easy large family meal ideas for when you need dinner to (almost) make itself because of whatever reason <insert any minor catastrophe that can (and will) occur in a large family at some point each week>. Detailed recipes are not included but are easily found on Pinterest. 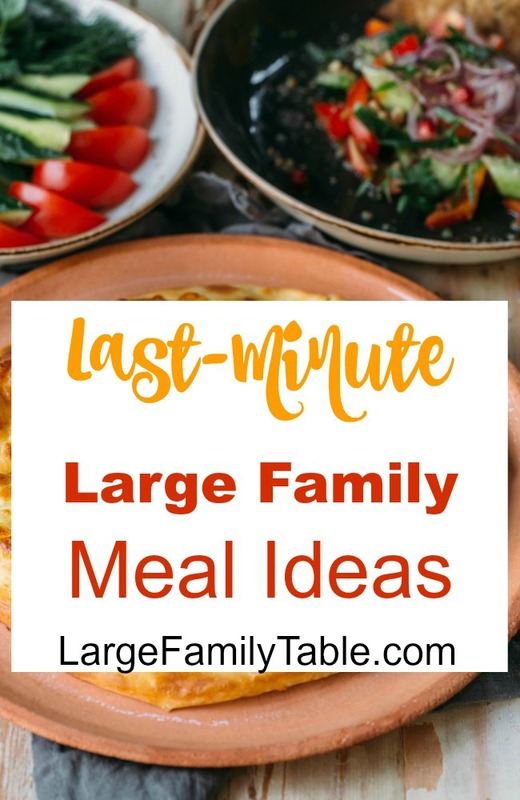 Feel free to print up this list of ideas and keep it taped inside your pantry for those nights when you have just several minutes to prepare a meal that will satisfy hungry children (and hubby, too). A quick glance at this list will give your tired brain several options to choose from based on your ingredients. Store-bought or home-canned goods, either way, you are sure to have some of these on hand for last-minute meals. 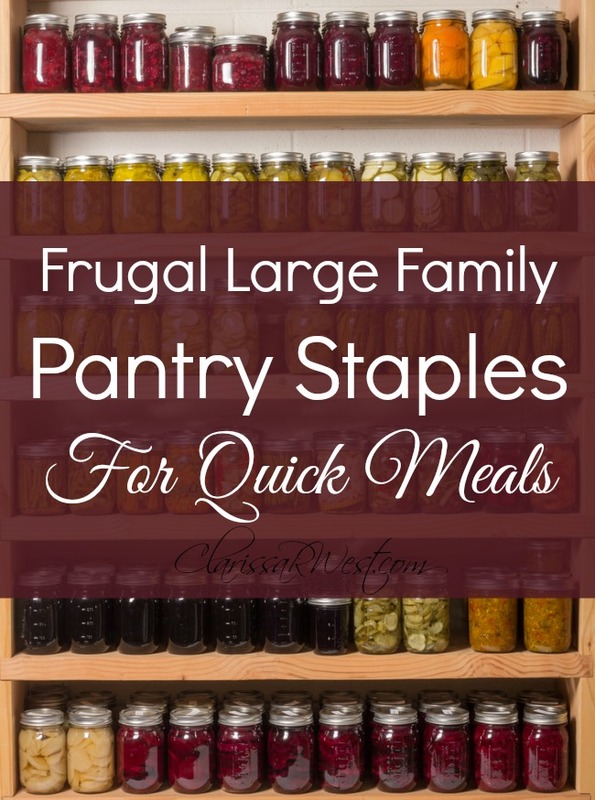 If you need help stocking your pantry check out my Frugal Large Family Pantry Staples For Quick Meals. Chili – Meatless or add canned beef or pre-cooked ground beef from the freezer. I simply mix together a variety of canned beans, tomato sauce, and chili seasonings and heat through. Serve with garlic toast. Soups – Vegetable, beef, or chicken soup using canned broth, veggies, and meats. Add Ramen noodles or the Trim Healthy Mama Noodles for more substance. Green Salads – Top leafy salad greens with canned tuna, chicken, or salmon. Or, make a Green Pea Salad by bringing a big pot of frozen green peas to boil, drain and add canned chicken, salt & pepper, and a little mayo. You can add shredded or cubed cheese and/or bacon bits, too! Sandwiches – Grilled cheese, chicken or tuna salad sandwiches, or BLTs. If your bread is frozen, then toast it first (no need for the grilled cheese). Heat a pot of canned tomato or chicken noodle soup if you have time. Cold Bean Salads – 3-bean, black-eyed pea, Mexican style… there are several bean salads to choose from. Just open, drain, rinse, and dump canned beans & veggies into a bowl, add the seasonings and liquids (usually consisting of oil and vinegar). Serve with tortillas or chips. Asian Dishes – Make a quick “Chow Mein” by sauteeing a bag of frozen stir fry veggies until tender then add canned meat of choice, broken Ramen noodles or rinsed THM Noodles, and toss together with a pinch of ginger, splash of soy sauce, and seasoning salt. Or, leave out the noodles and make a curry with canned coconut milk and turmeric to serve over the noodles or instant rice. Mexican Dishes – Beef & bean burritos are a favorite around here, but on nights that I forgot to thaw ground beef, I use just canned beans or chicken/beef for the filling. Or fry up some cheese/chicken quesadillas. Top with plain Greek Yogurt for a healthy boost! Rice Skillet – Cooked instant rice tossed with canned chicken and/or beans is an easy meal my kids love. You can make it either Asian (fried rice), Cajun (dirty rice), or Southwest style depending on seasoning and toppings. Add drained canned peas & carrots for fried rice, red beans for dirty rice, and canned corn for Southwest style. Breakfast For Supper – If all else fails, scrambled eggs and toast is a quick & healthy meal! You can also make a hearty skillet with scrambled eggs, chopped lunch meat (or canned meat), and veggies of choice. Remember Mamas, the very act of gathering your family around the table to enjoy each others’ company over a meal matters more than how long it took you to prepare the food. Whether you spent hours preparing it or just threw it together last-minute, it is a labor of love and act of service! Speaking from my own experience, it will be the atmosphere around the family table that your kids will remember most, rather than the specific foods. And it’s called comfort food for the feelings a particular dish evokes in us… bringing us back to our best memories of family around the table! 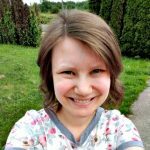 Clarissa is a Christian, Wife, Homeschool Mom to 7 Children with Medical & Special Needs, Grieving Mom to 1 Child in Heaven, Homemaker, and Writer. You can find her at www.ClarissaRWest.com sharing practical tips & encouraging others to count blessings, seek joy, and find strength in Jesus.